Listen to the interview with David Bay on the Southwest Radio Church Watchman on the Wall radio program. Is it possible that the Satanic Paradigm Shift leading to a Universal Mind come in the form of a world-wide Marion apparition? We demonstrate that the Roman Catholic Papacy is anxiously awaiting just such an apparition as it will validate the Catholic Church as the only true worldwide church and will propel the Pope into position as the top world religious leader. Satanists call this event the Paradigm Shift while Catholics would call it a "Marion Apparition", but the result will be the same, the Universal Mindset. On December 21, 2012, the world is supposed to enter into a New Age of spiritual enlightenment and awareness. This astrological chart cast for December 21, 2012, depicts the Yod – the finger of God – pointing to this new spiritual energy and spiritual healing. For the past several thousand years, mankind has been collectively yearning for a spiritual healing of the nations, a time when wars, hatreds and divisions will miraculously give way to peace, love and unity. New Age literature abounds with this message of hope and change. Authors teach that this idyllic new “Garden of Eden” will occur only after the New Age Christ is on the world scene, leading mankind into a most peaceful New World Order. 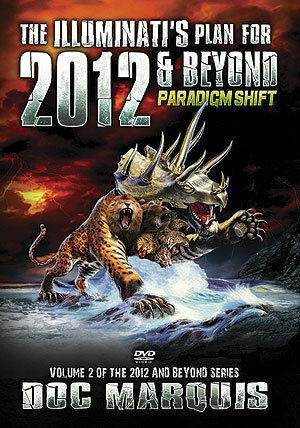 In Volume 2, we shall examine some other cultural and spiritual expectations for 2012 and then we shall present the real point-in-history change which the Elite seem to have planned for December 21, 2012, a change known as the "Paradigm Shift". Antichrist cannot arise until and unless this paradigm shift in spiritual values has occurred. Unless God specificially stops the Illuminati, their demonic Guiding Spirits may just have this long-awaited Paradigm Shift planned for December 21, 2012. New Age adherents are looking forward to this day as enthusiastically as we Christians are looking forward to the Rapture of the Church!